No vehicle can match the Outstanding Looks and Aesthetics of the Hyundai Elite i20 in its segment. The i20 was launched in 2014 and even today the car feels very modern and upmarket. 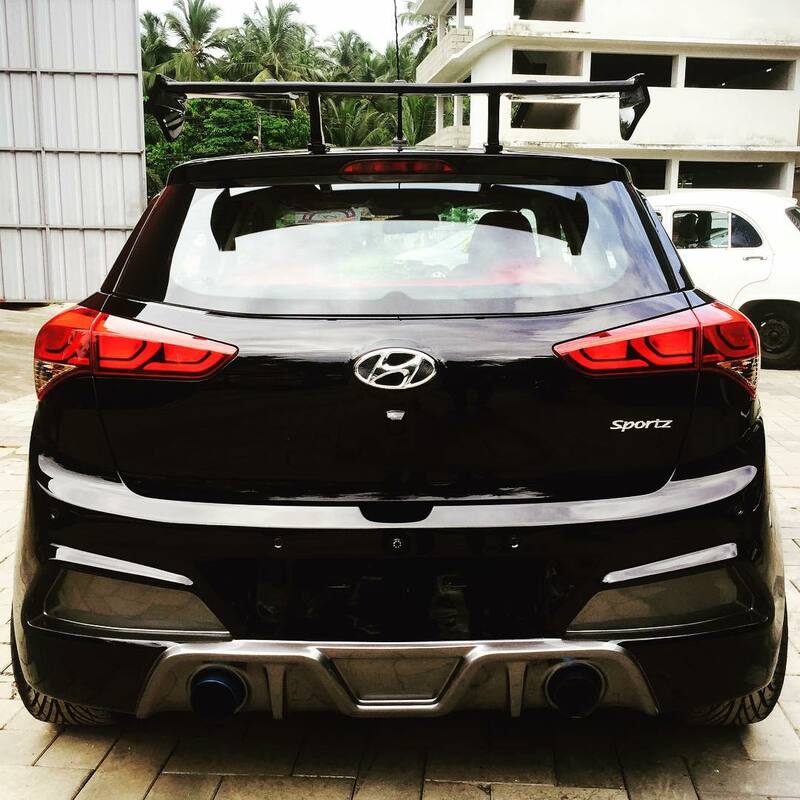 The Hyundai Elite i20 is very capable of some great modifications that may not be same with the similar cars in its segment. 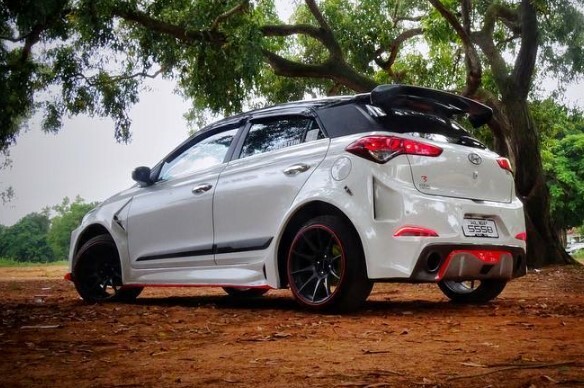 Below are some of the Best Modifications and looks that the i20 could attain, and that could easily give some high-end cars a run for its money. 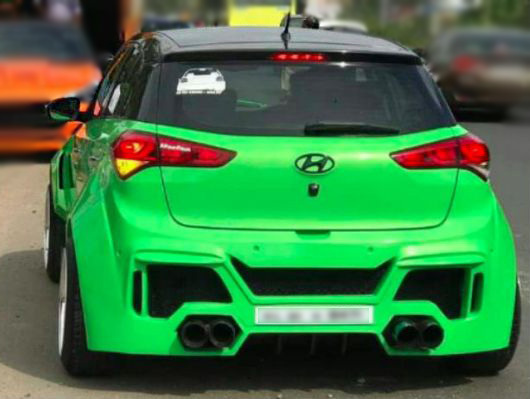 This Hyundai i20 modified example above gets a whole new custom Wide-Body kit. 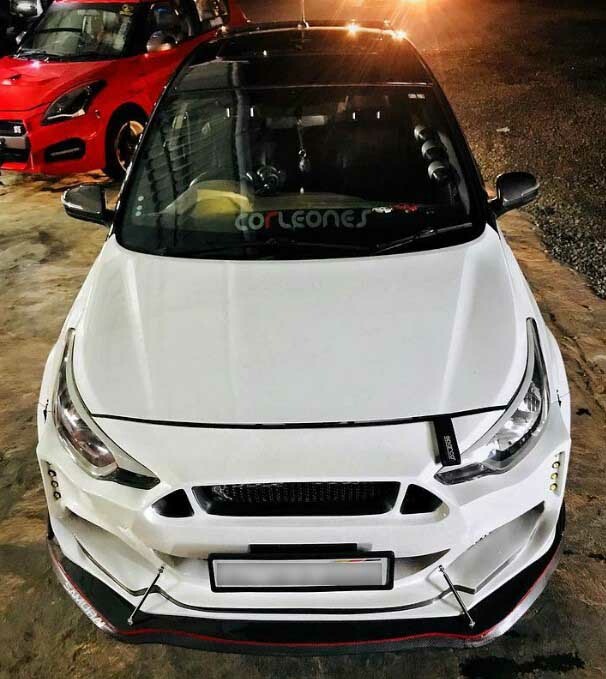 The front resembles the Ford Mustang quite well with the signature Ford Mustang trapezoidal 3-Part grille, large air dampers, larger air-intakes and faux Carbon-Fibre diffuser with red-contrast lining that is carried along the diffuser. There is a quad-LED DRL cluster on both sides below just below the stock headlamps that appear unchanged. The C-Pillars, Roof and ORVMs have been blacked-out. The Alloy wheels have been upgraded too with a new multi-spoke design that adds great finish to the overall look of the vehicle. Coming to the rear, smoked-taillights and faux-slit on the sides look very attractive and pleasing. There are twin exhaust-pipes divided by the red-contrast diffuser. 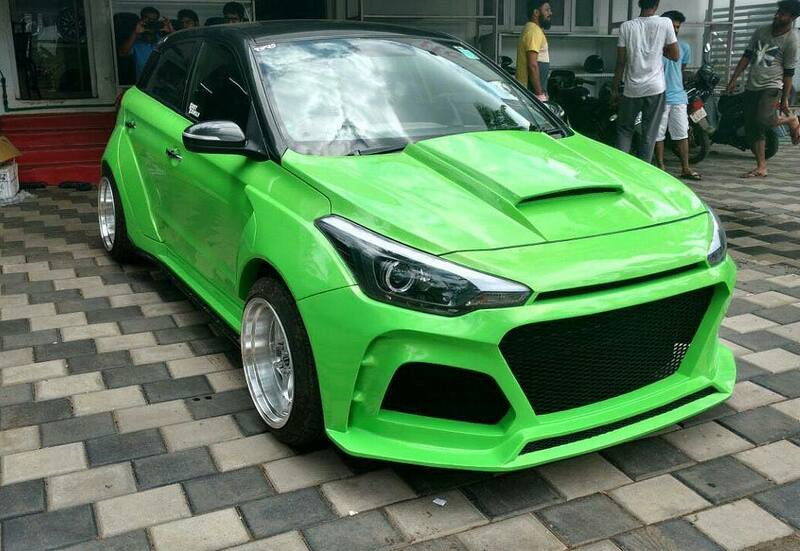 The above Neon-Green modified Hyundai i20 example looks very magnificent and irresistible with the custom Wide-Body kit it got. 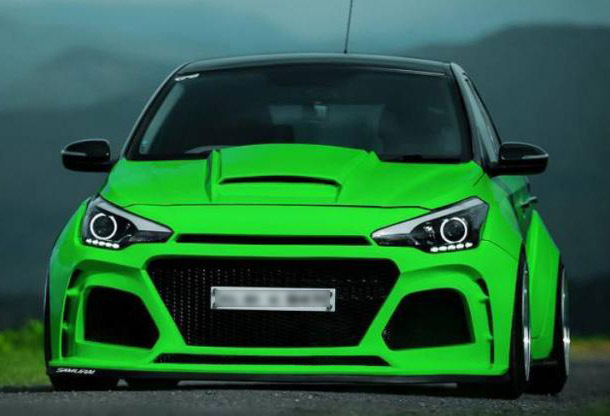 The front of the vehicle gets a big hood scoop, a much aggressive bumper, larger air-intakes and air-dampers, faux-slits on each side. The vehicle also gets new projector headlamps with inline quad-cluster LED DRLs. 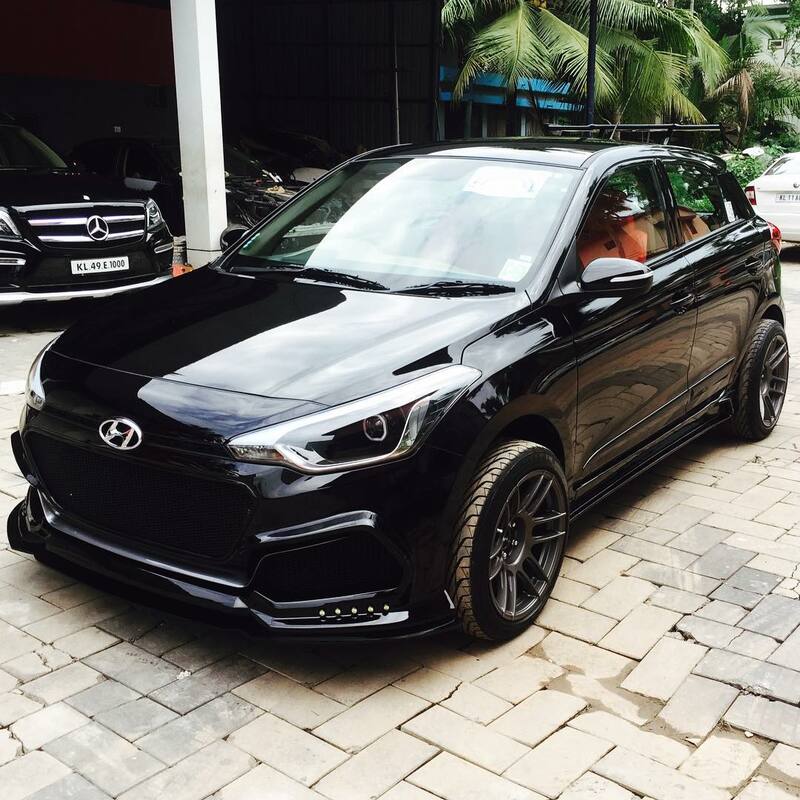 The Roof, ORVMs and C-Pillars and all the stock chrome parts (Hyundai Logo & Front Bumper Grille) have been blacked out to maintain the dual-tone finish of the vehicle. 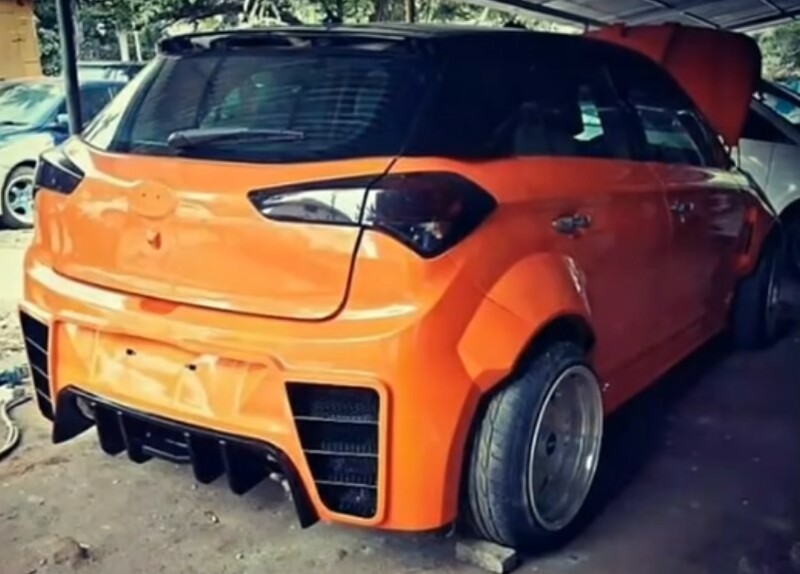 Coming to the rear, the bumper looks quite aggressive to match the aggressive front of the vehicle and the presence of Quad exhaust tips looks very appealing. The Vehicle also gets an upgraded set of much wider chrome alloys along with new low-profile tyres. 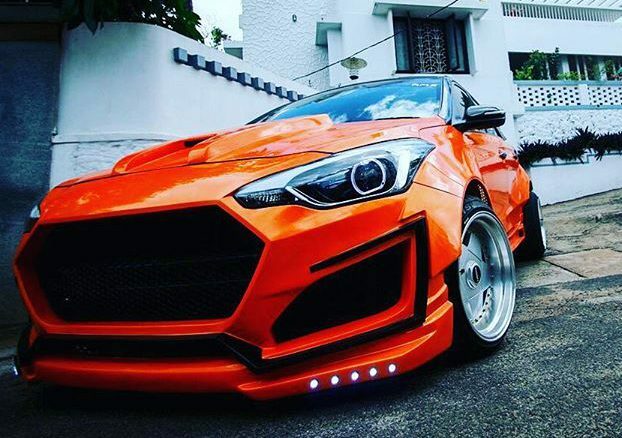 The “Orange-Rush” Hyundai i20 modified example above gets an ultra-aggressive front bumper with splitter, making it appear very sharp with larger air-intakes and 5-Dot LED clusters at the bottom on each side. Stock headlights have been replaced with custom aftermarket projector ones with corona-ring LED DRLs. The vehicle has been lowered too and the ORVMs, roof and C-Pillars have been blacked-out which makes it look great and even more attractive. Stock Rims have been upgraded with new Ultra-wide Alloys along with low profile tyres. Coming to the rear, black-smoked taillights looks amazing and add to the overall dual-tone finish of the vehicle. 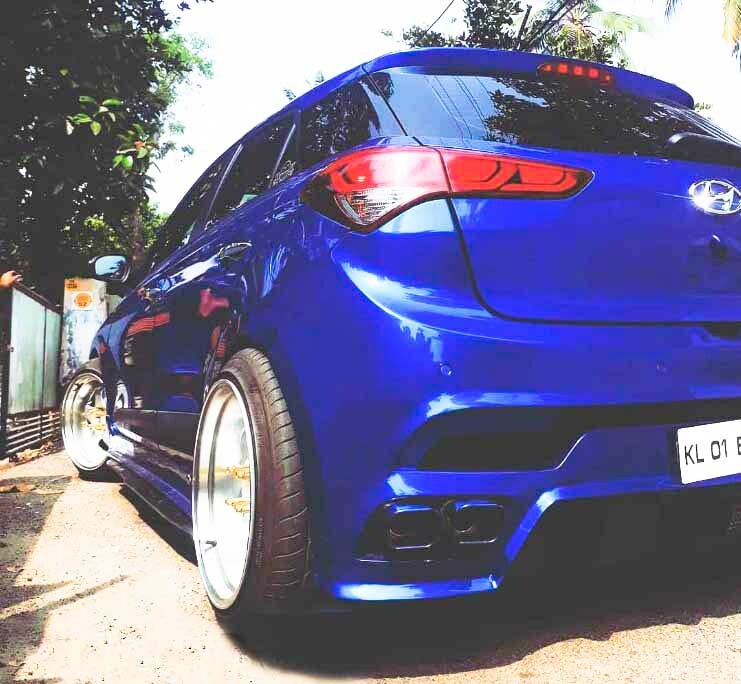 Rear bumper has been upgraded as well with a new aggressive one with gloss black diffuser maintaining the overall aggressive attire of the vehicle. 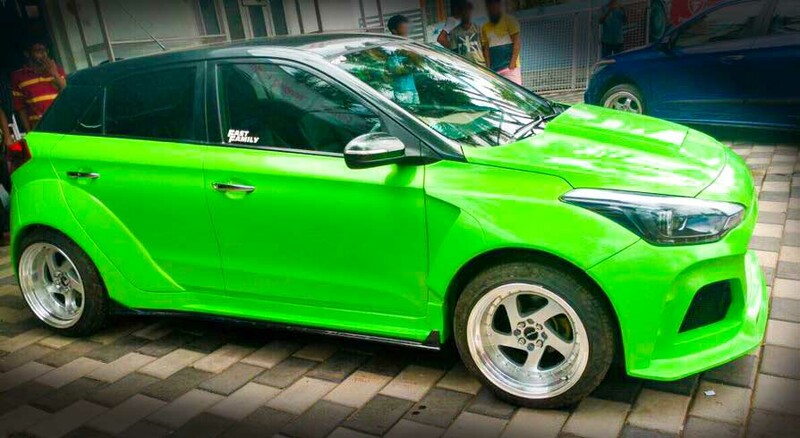 The above modified example from Kerala gets a complete makeover over the stock Elite i20. Right from the High-Gloss Metallic Black finish to the custom wide-body kits, this vehicle has them all. 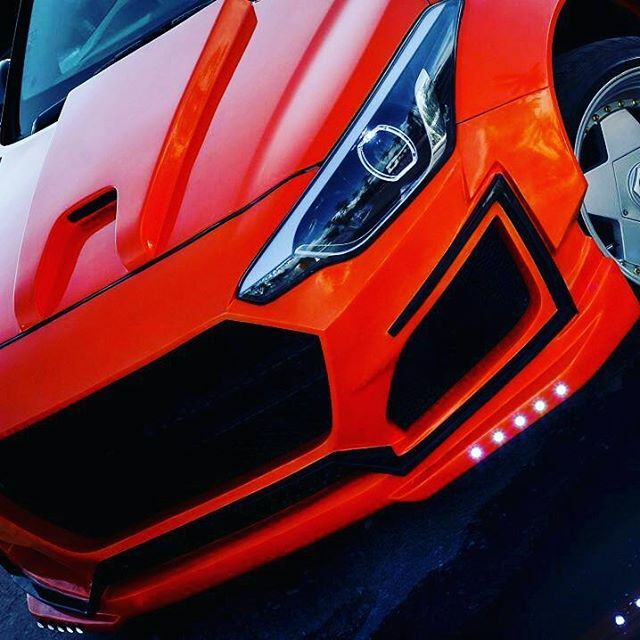 Glancing at the front, the vehicle gets a new bumper with splitter with larger air-intakes and chrome Honeycomb grille. A 5-Dot LED Cluster is visible at the bottom, similar to the previous example. 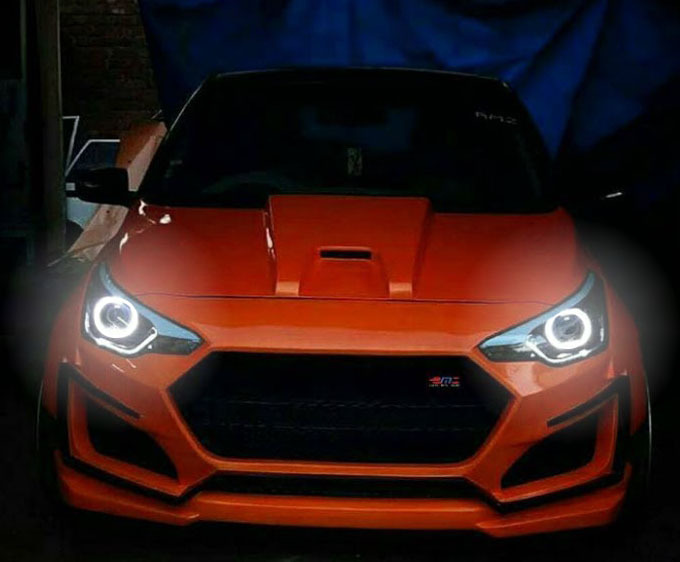 All the chrome inserts across the vehicle have been kept intact and stock headlights have been replaced with aftermarket ones that sports a projector setup along with Ring LED DRLs. 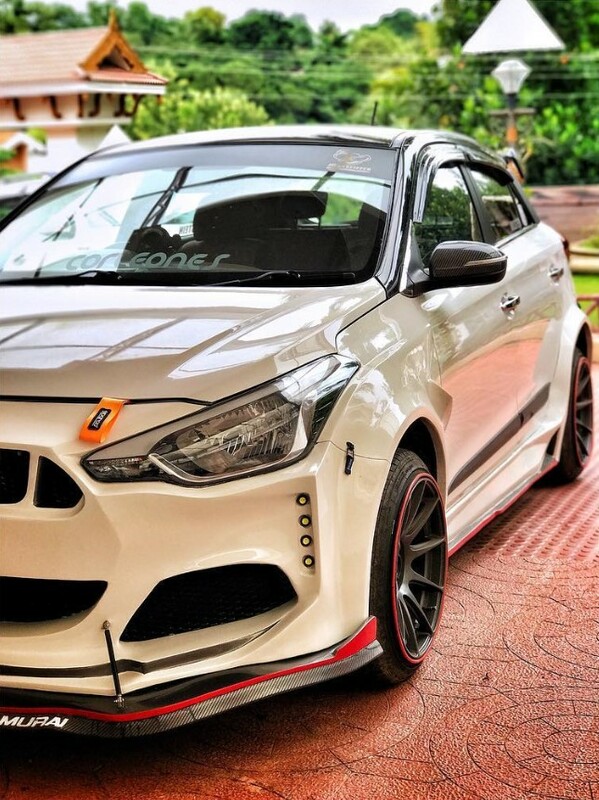 Coming to the rear, the vehicle gets twin broad exhaust pipes on a sporty new bumper consisting of a new brushed-metal finish diffuser and larger air-intakes too, matching the front. The taillights however have remained untouched. The vehicle gets Wine-Red leather upholstery and a roof-mounted spoiler. 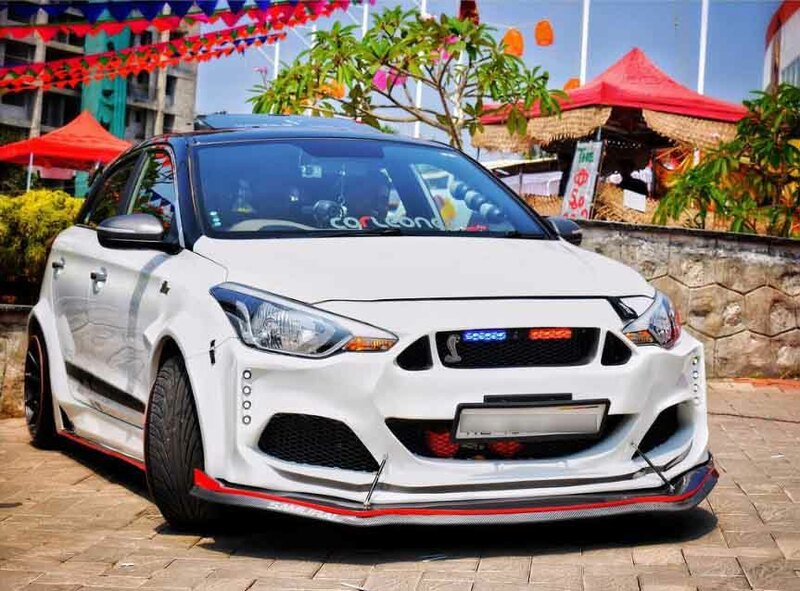 This modified Hyundai i20 example above gets a custom Wide-Body kit too that gave a much sharper and meaner look to the vehicle. The vehicle gets a new aggressive front bumper with a Quad-LED cluster at the bottom quite similar to the above examples. Chromed Honeycomb grille is visible on the front along with new projector headlamps that sports a 5-Dot DRL cluster too. 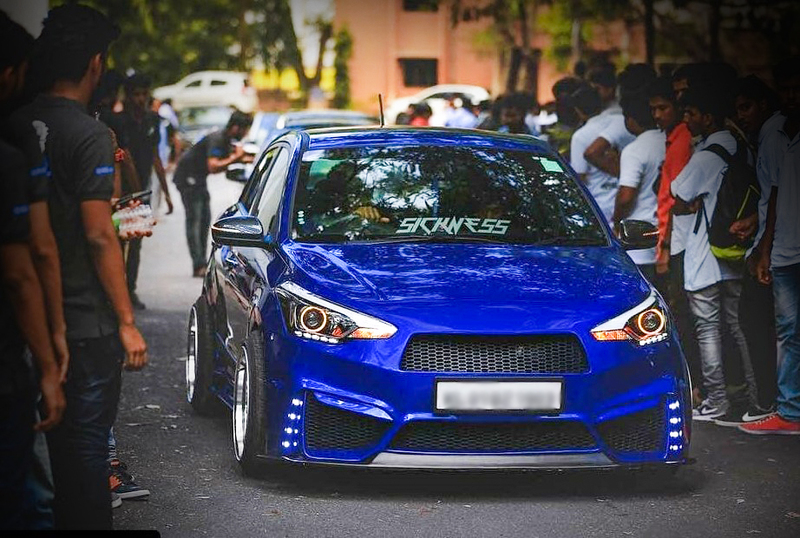 Side-skirts add more to the already ravishing look of the vehicle and the new wide-profile tyres match the wide-body kit on the vehicle. Coming to the rear, Quad-pipe rectangular exhaust tips look great on the new sporty rear bumper with diffuser. 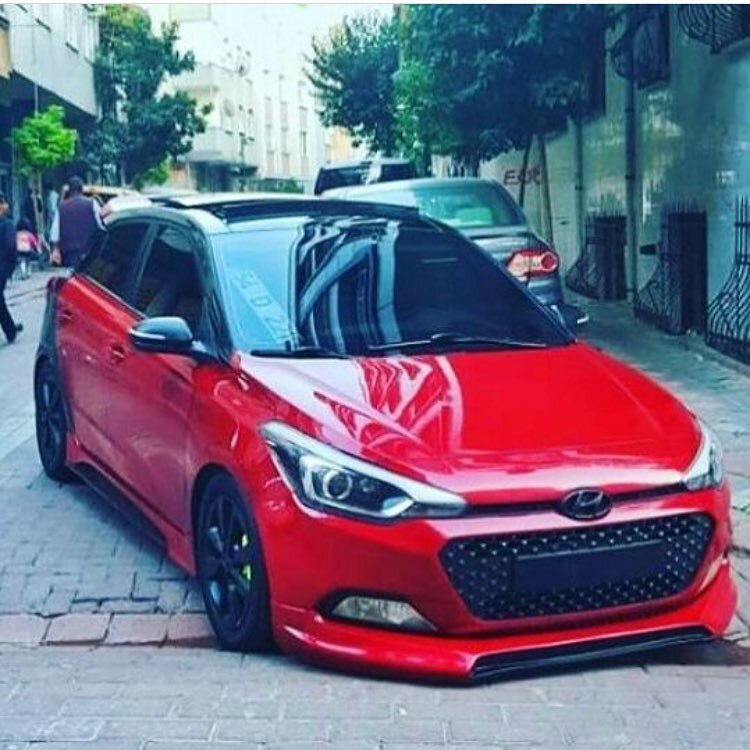 This modified Hyundai i20 gets a custom body-kit making it look much sharper, more appealing and truly unique. The roof, the rear-view mirrors and the stock diamond cut alloy wheels have been blacked out giving the vehicle a much cleaner dual-tone look. 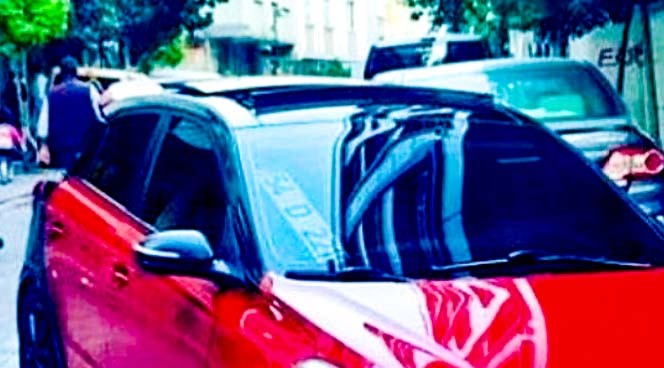 There is an aftermarket panoramic sunroof installed upon the roof along-with new front and rear bumpers with split-diffusers. 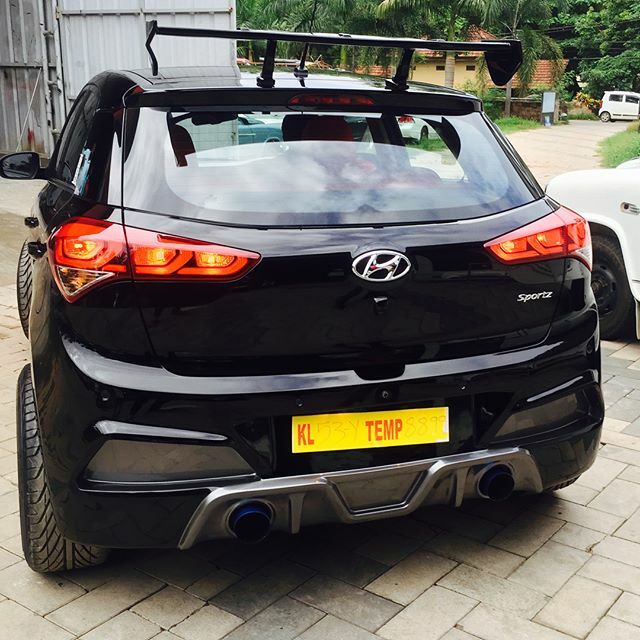 This modified i20 also gets customized projector headlamps with LED DRLs. 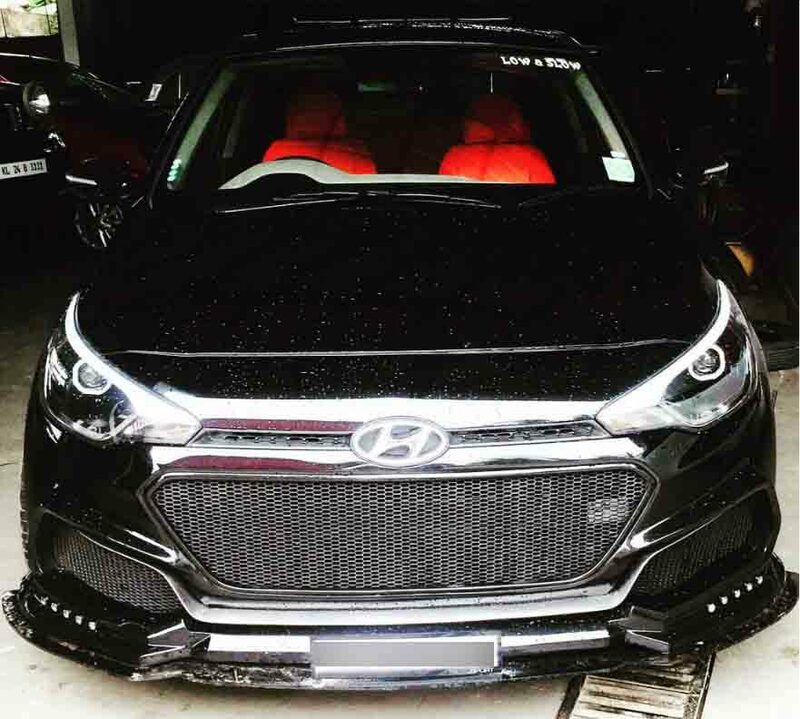 All the chrome inserts across the vehicle, such as the Hyundai logo on the front and the back and the front grille have been blacked out as well to match the overall dual-tone finish of the vehicle.